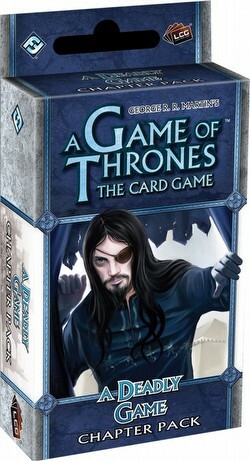 A Deadly Game is the second Chapter Pack in the Wardens cycle for A Game of Thrones: The Card Game. A Deadly Game continues the main themes of the Wardens cycle, adding new support to trait-based decks and increasing the power of abilities such as the "limited response." In this Chapter Pack, you will find powerful Castle plots that trigger their effects upon moving to your used pile, even as Clansman, Dothraki, and Sand Snake decks grow in strength. From the sands of Dorne to the lofty heights of the Eyrie, every House gains new cards to strengthen their claim to the Iron Throne in this Chapter Pack. Meanwhile, at the fortress of Riverrun, House Stark and its allies in House Tully strengthen their defenses and forge their plans to claim power and victory by winning A Deadly Game. Each pack contains 60 cards (3 each of 20 different cards).